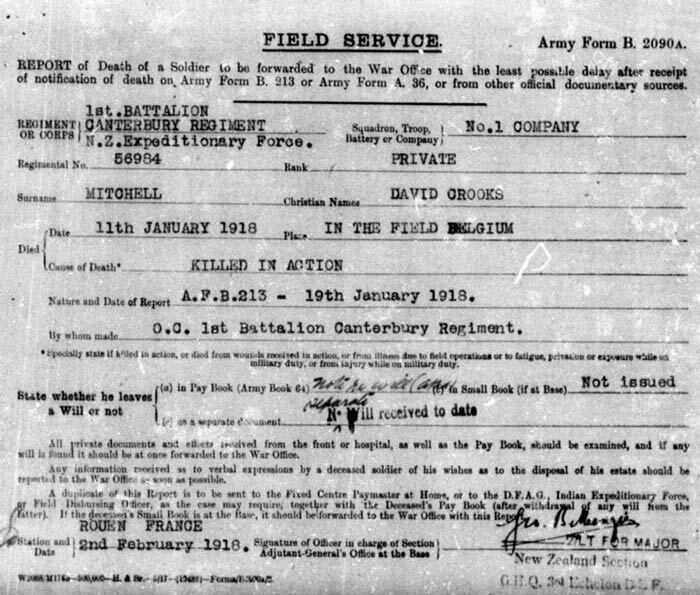 15/04/2018 Private David Crooks Mitchell embarked on 13 August 1917 with the 29th Reinforcements F Company from Wellington, New Zealand bound for Glasgow, Scotland on the ship Ruahine. 15/04/2018 David Crooks Mitchell was the son of David and Annie Mitchell. David Mitchell and Annie Glasgow were married on 17th October 1880 in the district of Cookstown. 15/04/2018 David was born in the Cookstown area on 28th March 1892. His enlistment papers give that date as 1893. He was one of nine children, seven surviving. 15/04/2018 Known family: David Mitchell, Annie Mitchell, William James Mitchell (born 16th September 1881), Alexander Mitchell (born 29th December 1883, died 19th June 1884), Mary Jane Mitchell (born 24th July 1885), Margaret Mitchell (born 29th February 1888), Annie Cary Mitchell (born 2nd February 1890), David Crooks Mitchell (born 28th March 1892), Samuel Mitchell (born 18th August 1895), Ellen Mitchell (born 13th September 1896), George Ernest Mitchell (born 17th March 1902). 15/04/2018 The 1901 census lists David Crooks as age 9 living at house 37 in Dunmore, Lissan Lower. David was still at school but working on his father’s farm. David’s grandfather, John Mitchell, was also living with the family. 15/04/2018 The 1911 census lists David Crooks as age 19 living with the family at house 9 in Dunmore, Lissan Lower. He was still working on his father’s farm. 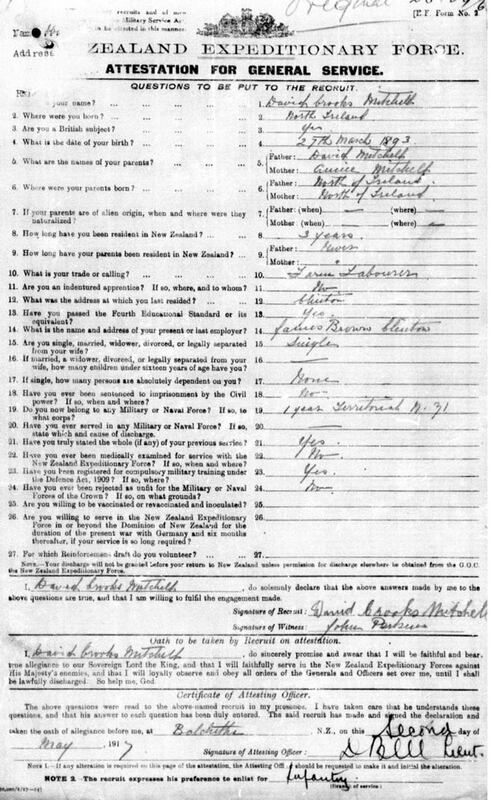 15/04/2018 Both David and his oldest brother William emigrated to New Zealand about 1914. 15/04/2018 It seems William went to live with relations at Northbrook Road, Rangiora - Jane Crooks and Crooks Mitchell. Another casualty form the Cookstown War Dead, Lance Corporal William John Crooks was their son. 15/04/2018 David had spent one year with the Territorial Army in New Zealand. 15/04/2018 He gave his next of kin as his eldest brother, William J Mitchell who was by then living in Marine, Clinton, New Zealand. 15/04/2018 Farm servant, at present a member of the New Zealand Expeditionary Forces. I revoke all former wills. I give, devise and bequeath all my real and personal estate whatsoever and wheresoever situated onto my father, David Mitchell of Dunmore, Cookstown, County Tyrone, Ireland (farmer); my mother Annie Mitchell; my brothers Samuel Mitchell and George Ernest Mitchell (all of Dunmore) aforesaid in equal shares share and share alike. 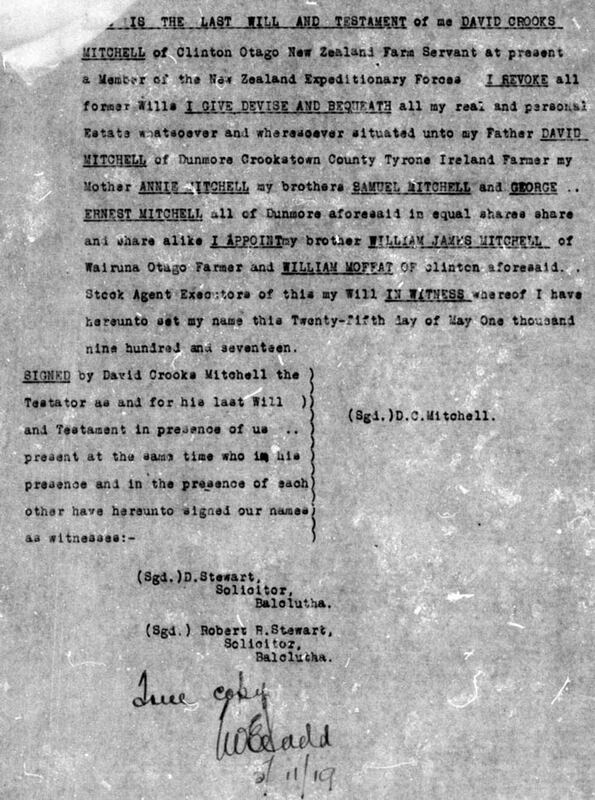 I appoint my brother, William James Mitchell, of Walruna, Otago (farmer) and William Moffatt of Clinton aforesaid, Stock Agent Executors of this will in witness whereof I have hereunto set my name this 25th May 1917. 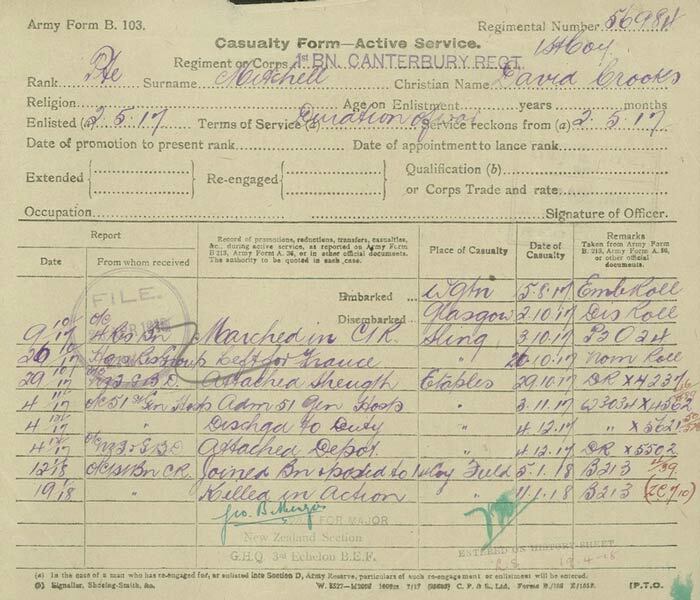 15/04/2018 Private David Crooks Mitchell was serving with the No 1 Company of the 1st Battalion of the Canterbury Infantry Regiment when he was killed in action in Belgium on 11 January 1918. 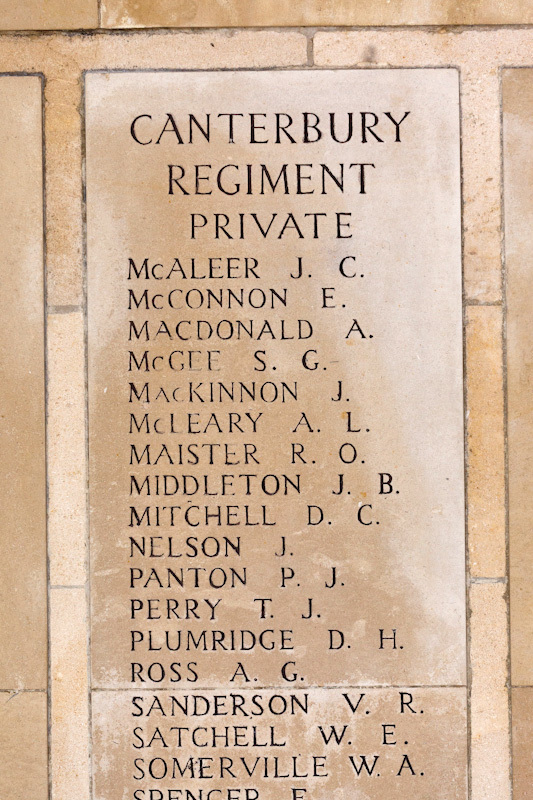 15/04/2018 Private David Mitchell has no known grave and is commemorated at Buttes New British Cemetery (NZ) Memorial in Polygon Wood, Belgium. 15/04/2018 In his will David left his effects to his family. 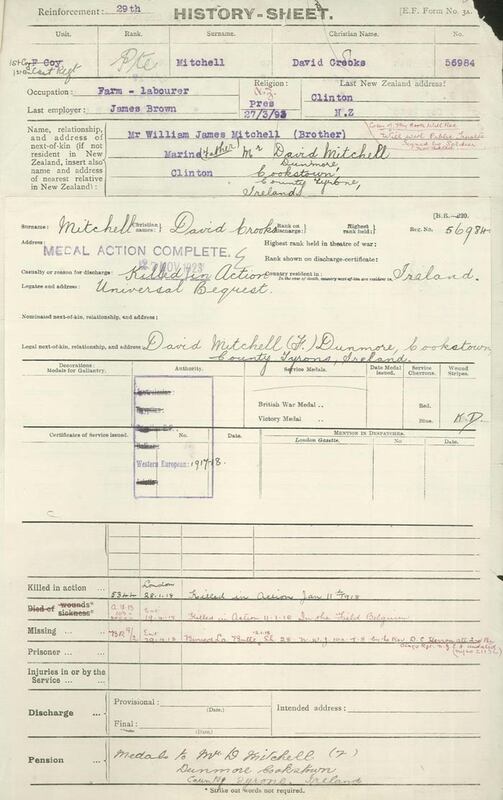 15/04/2018 David Crooks Mitchell enlisted with the New Zealand Expeditionary Force on 2nd May 1917 in Balclutha, Otago, at the very southern point of the South Island.